The Rapid’s Bus Rapid Transit (referred to as BRT), also known as the Silver Line, is completing its $40 million construction through downtown Grand Rapids and south Division. While we constantly hear The Rapid’s talking point that the BRT will potentially save bus riders 40% in reduced travel times, we decided to take a look at just how rapid the Bus Rapid Transit line will be when it opens August 25, 2014. According to The Rapid’s documentation on the BRT, the new route will be 9.7 miles in length and will take approximately 35 minutes to complete the trip from The Rapid’s bus station in downtown Grand Rapids to its final stop at 60th Street and Division. That’s an average speed of 16.6 miles per hour. Although that doesn’t sound very fast, it’s instructive to put that speed in the context of the other regular bus routes that The Rapid operates. How does the BRT stack up? Pursuant to a Freedom of Information Act request to The Rapid, which asked for the length of all its routes, and comparing those route lengths with the bus schedule on The Rapid’s web site, we created a chart showing the average speed of The Rapid’s buses on each of its bus routes. The Silver Line’s average speed (in red) compared to The Rapid’s other routes (in green). 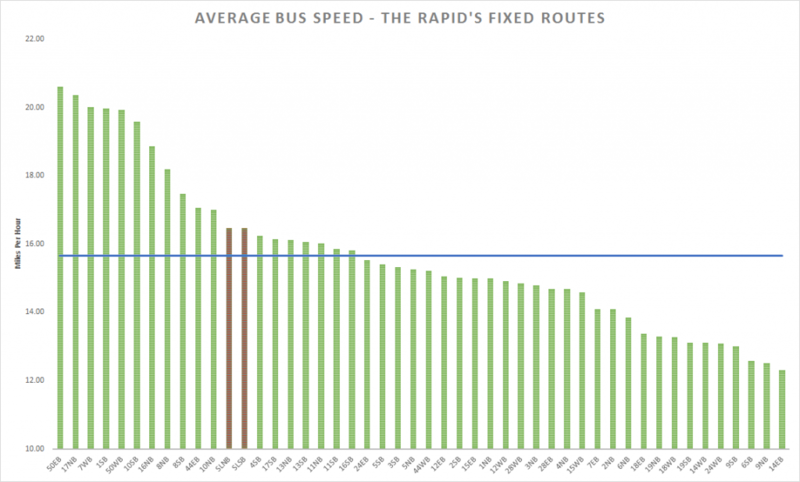 Although the Silver Line is slightly faster than the average bus in The Rapid’s system (average is represented by the blue line), it’s slower than about a quarter of The Rapid’s existing buses. The Rapid’s Conrad Venema admitted that our analysis is correct in an article with Crain’s Detroit Business, while claiming that our comparison is unfair because part of the Silver Line’s route will be averaging 22 mph along Division Avenue, just a bit faster than the current 18 mph of Route 1’s buses. “If you compare apples to apples — the same section of roadway of the two routes — the (Silver Line) is doing about 22 mph, while the No. 1 is doing about 18 miles an hour,” Venema said. Once the Silver Line reaches the core downtown, it meanders at a rate of about 10 mph as it hits employment centers, while Route 1 takes a faster route to The Rapid’s central station. Of course, this also means, as pointed out above, that much of the Silver Line’s route is running at 10 mph, slower than even the slowest of The Rapid’s existing bus route average speeds. It’s instructive to understand that The Rapid’s 40% reduction in travel time talking point only applies to anyone who is trying to travel from 60th Street and Division to Michigan St. The only reason that the Silver Line would reduce travel times for those (few) individuals is because riders would have to make a bus change to do that with the current routes. Of course, The Rapid could have achieved the same result by simply adjusting an existing route to take riders to Michigan St., which would have saved $40 million in Silver Line construction costs. Overall, the Silver Line doesn’t seem to be adding much to The Rapid’s existing offerings, except a very expensive new set of bus stops along The Rapid’s existing routes.